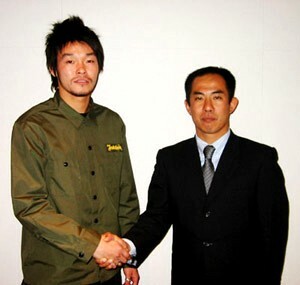 Hokushinetsu League Division 1 side Fervorosa Ishikawa Hakusan have announced their first major signing in preparation for 2007. Yutaro Abe is a 22-year-old forward who moves to the club from Yokohama F Marinos, although he has spent the last two seasons on loan at J2 outfit Montedio Yamagata. Abe made his J-League debut for Marinos at the age of just eighteen and his footballing CV also boasts international appearances for Japan at every age group from U15 to U20. Seeking more playing time than a fringe player at one of the country's biggest clubs could expect, he joined Yamagata and in 2005 played 27 league games, scoring five goals. In the season just finished, however, Abe made only seven appearances, squeezed out by the arrival of star Brazilian Leandro. Fervorosa will be hoping that his arrival in Ishikawa will serve to make the team more able to cope with life in the fiercely competitive Hokushinetsu League. 2006 saw them end up fifth out of eight teams, well off the pace of the likes of Matsumoto Yamaga Club and title winners Japan Soccer College. Hokushinetsu League Division 2 side Toyama Shinjo Club have announced the appointment of Tadashi Takemoto as their new coach. Takemoto spent his playing career with Shinjo and has subsequently gone on to coach at High School and University level, although last year his career took on an altogether more surprising dimension when he took charge of the national team of Saipan in the Northern Mariana Islands. Toyama Shinjo Club were formed as long ago as 1968, their players coming from amongst the pool of local graduates. For fully 35 years, they participated in suburban and city leagues, as recently as 2003 deciding to take things more seriously and aim for the Regional League. A revamped squad took the Toyama Prefectural League title the following year and gained promotion to Division 2 of the Hokushinetsu League. There Shinjo made an immediate impact, finishing 2005 as runners-up to Matsumoto Yamaga Club. They nevertheless just lost out in a promotion / relegation play-off with Niigata University of Management and the 2006 campaign was a major disappointment in comparison as Shinjo slumped to a sixth-place finish. With neighbours Valiente Toyama having moved up to Division 1 and aiming to provide a credible challenge from their home prefecture at Regional level, Takemoto will in the forthcoming season need to work hard to keep motivation levels high amongst his players. But Division 2 looks wide open and Shinjo may still be able to fight for a promotion place.